AweEraser for Mac Enterprise gives easy and secure data erasure solution for all Mac users. It can permanently erase data from unlimited Macs, external storage devices, digital devices, etc. Once the data is erased by this data erasure software, the data can’t be recovered by any data recovery method. 1. File Shredder – shred files and folders permanently. 2. Disk Wiper – wipe hard disk drive entirely to erase all data permanently. 3. Free Disk Space Wiper – permanently erase already deleted/lost data without affecting the existing data. 4. Internet Cleaner - clean up browser’s histories, cookies, password, junk, caches, etc. And help you uninstall unwanted applications in batches. 5. Uninstaller – uninstall unwanted software and clean up all leftovers. AweEraser for Mac Enterprise offers 100% safe data erasure algorithms including HMG Infosec Standard 5 (1 pass), German FOFIS (2 passes), DOD 5220.22-M (3 passes), U.S. Army AR380-19 (7 passes), Peter Gutmann's algorithm (35 passes). Once the data is erased AweEraser for Mac Enterprise, the erased data is lost forever, can’t be recovered by any data recovery method. 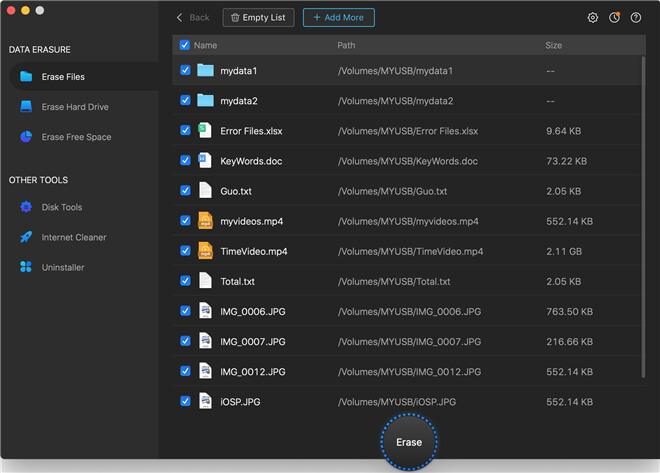 Singlemizer for Mac (Popularity: ) : A superior duplicate files scanner application which will help you eliminate file clutter on your disks. - Singlemizer provides superior user-experience with clean and minimalistic interface.